Dost sometimes Counsel take – and sometimes Tea. In this case the effect is intended to be (darkly) humorous. This is a common way of structuring jokes, I think. "In this case the effect is intended to be (darkly) humorous. This is a common way of structuring jokes, I think." Of course. It's the old "build-up-and-quickly-switch-expectations" gag. I'm sure it's no coincidence that the earliest recorded joke in English is one such "switcheroo" (though not a zeugma as such): Hangð hwæt fram þæt mannes þeoh ond gád tu pýtan þat hol hit pýteð ær? Her courage, her eyes, and his hopes." She let go her glass with a shrill little cry. Crash! Tinkle! It fell to the floor. Up her mind, and a dash for the door. C’mon, Benjamin, let us all in on the joke, please. Hangð hwæt fram þæt mannes þeoh ond gád tu pýtan þat hol hit pýteð ær? Se cæg. Hanging up, you're hot, you're so bad that you can do it? See cattle. It seems to lose something in Icelandic? Lewis, and that's surely the key to all humour. I hesitate to tromp on Benjamin's joke, but if you just Google the words, you get this website that explains it. If this is the one about the stiff thing that hangs below a man's waist and goes into holes, or similar, then I think all it shows is that the first humour was dirty! I stumbled repeatedly over what an "ativan" might be. Before I guessed the equivalent saying here (Oz English) would be "take a Valium". 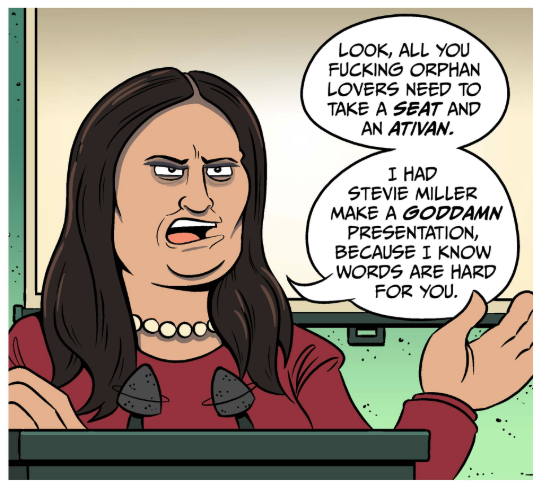 Leaving aside what I regard as a totally unnecessary obscenity in the cartoon caption, is the woman caricatured Sarah Sanders ? Yes; and while I don't think Sanders has actually cursed like this, it would fit her style so perfectly hardly anyone would notice if she did. @Graeme it's not a US vs. Oz distinction, they're just two different (though similar) medications. Ativan is a trade name for lorazepam; Valium is a trade name for diazepam. Both are benzodiazepines and both work for the joke of "take a [controlled substance anti-anxiety medication], though they are metabolized differently and diazepam is shorter-acting. Anecdotally, (in the US) younger people are more likely to talk about taking Ativan and older people are more likely to talk about taking Valium, which might reflect a shift in prescribing over the past few decades, but I don't really know. It could be partly a US v Oz distinction, if the trade name Ativan isn't used in Oz. The same medications are marketed under different names in different countries. I'm British and had never heard of Ativan, so it took me a while to realise what was meant, but I don't know whether the trade name isn't used here or was simply unfamiliar to me. In the UK medical staff rarely use trade names for routine medications that are given out all the time, and probably only pharmacists would know them. I never heard of Atvian before. I have heard of Valium. Maybe this means I know count as among the "older people."